Dylan said concerning the “hoopla” about quotations from literature and songs that only “wussies and pussies” complain about that stuff. According to him quotation is an enriching tradition. I agree. However I cannot see how copying almost verbatim could be seen as enriching. In this mind map I made a comparison of Scarlet Town with the works of Whittier. Please note that there are many other quotations from differents authors and songs as well, e.g. “Little boy blue come blow your horn” is taken verbatim from the lullaby Little boy blue. Scarlet Town reminds me of Working Man’s blues when considered the number of quotations. Image | This entry was posted in art, creativity, music and tagged Bob Dylan, John Greenleaf Whittier, Scarlet Town. Bookmark the permalink. Lots of people quote Dylan without giving him credit, so why shouldn’t he have the same freedom as the rest of us? Hi Thelma, is that true? I mean that al lot of people are quoting Dylan in songs? Dylan may quote as much as he want if it’s up to me. 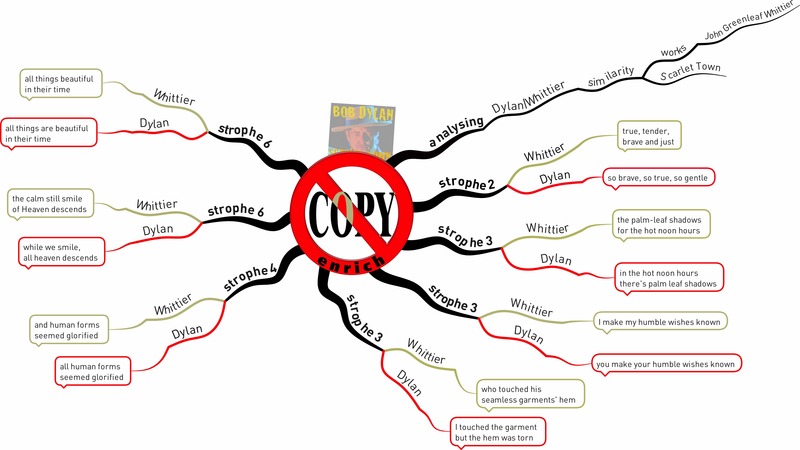 I just wanted to show that Dylan is speaking about enriching, but exact copying is not enriching, is it? I was not talking about credits. But I do think that if it is done on this scale, it would credit Dylan to mention his sources.